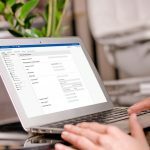 For insurance companies, onboarding new customers is a paper-heavy process: a great deal of paperwork must be filled out and reviewed by multiple parties, and sometimes underwriting is necessary for the customer to be approved. 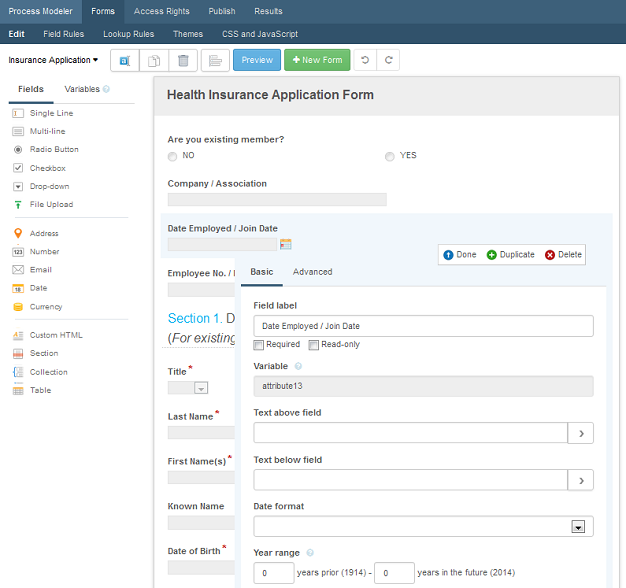 Here is how one health insurance company streamlined this process with Laserfiche Forms. Once the prospect fills out the form and clicks “Submit,” the form is routed to the insurance adjuster. The adjuster is notified by email that he has a new form to review. 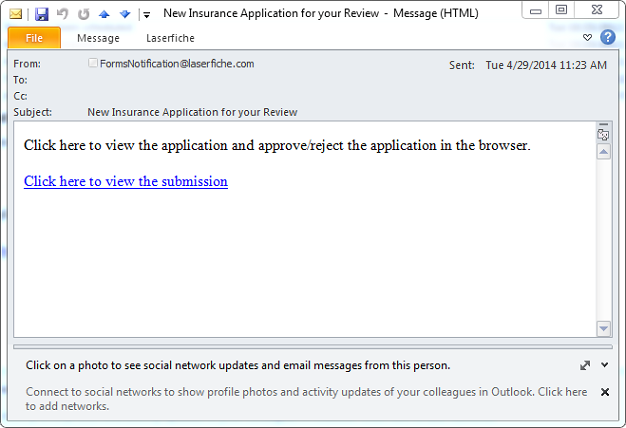 He can click the link in the email to access the submission within Laserfiche Forms. The insurance adjuster reviews the form to make sure it is a valid application and either approves or rejects it. If the application requires underwriting, he selects the appropriate radio button. 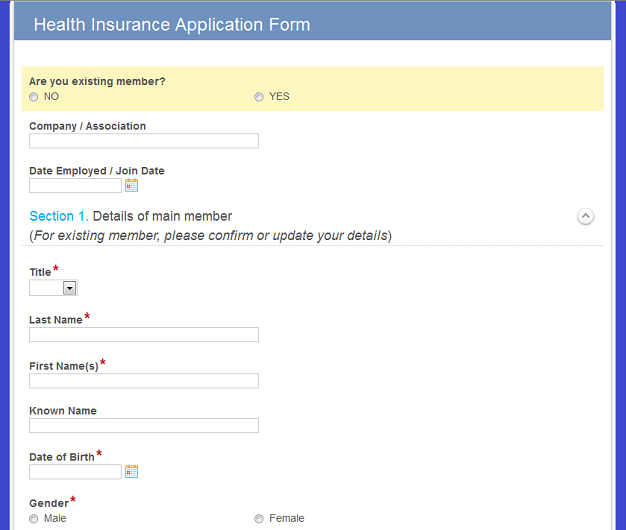 If the form does not require underwriting, the health insurance policy is automatically issued. Otherwise, the application is routed to the underwriter who must fill out an underwriting form. 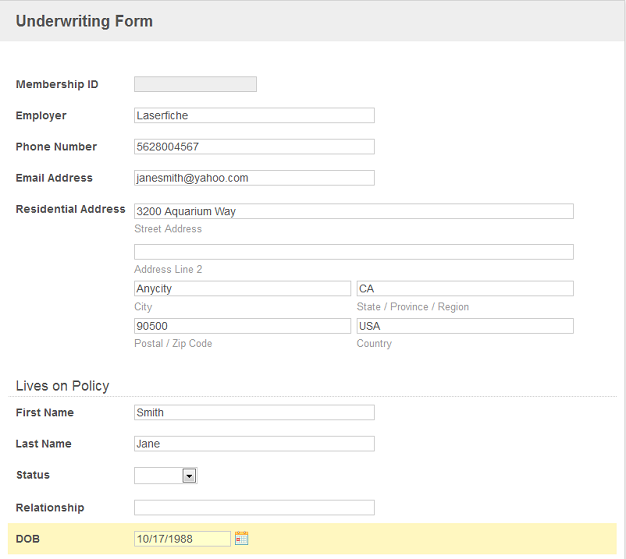 Some of the fields on the form are pre-populated from the insurance application. After the underwriting form is submitted, it is routed to the manager for final review. 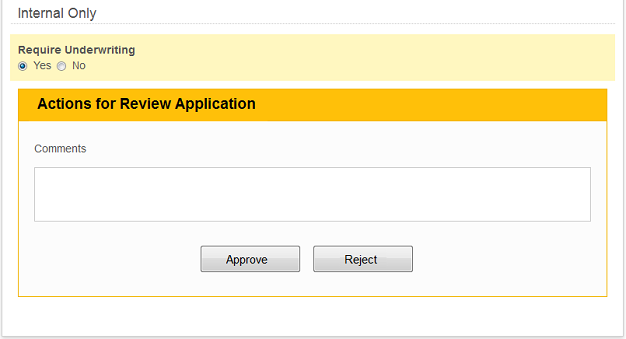 If the manager approves the form, he must also review the original application. Once that is approved, the policy is issued. The application is then routed to a folder in the Laserfiche repository for storage. If the underwriting form or application is rejected, the process ends. The two forms are created in the Form Designer. Some of the fields in the form are dynamic. 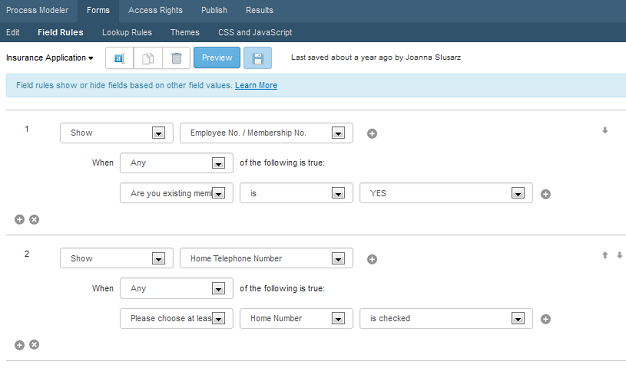 For example, if someone checks “Yes” in response to “Are you an existing member?” then the “Employee No. / Membership No.” field appears. If someone selects “No,” this field does not appear. These fields are configured in the Field Rules page. 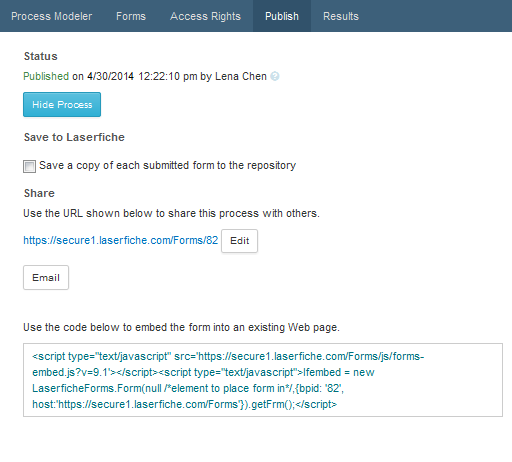 The entire business process is designed in the Laserfiche Forms Process Modeler. This process starts when an applicant fills out the form on the company’s website. The form is embedded on the site using the code found on the Publish page. 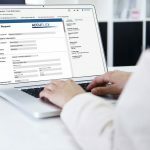 Once submitted, the form moves through the various user tasks, each one representing an action performed by the adjuster, underwriter or manager. 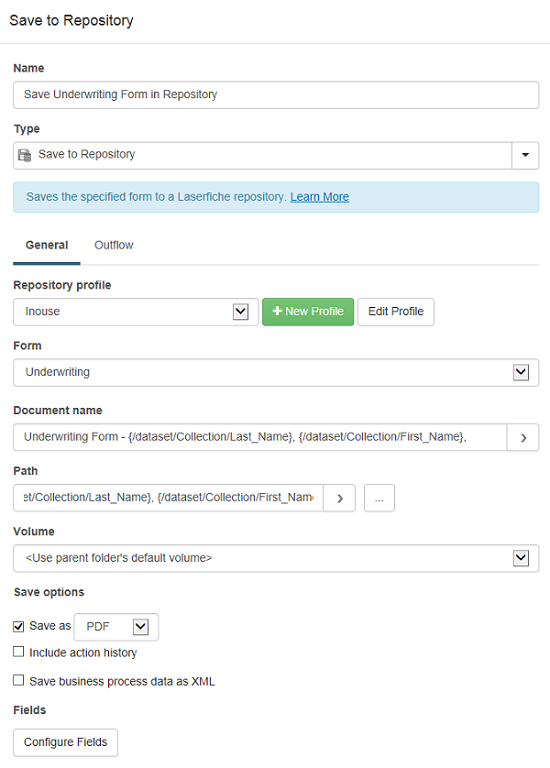 When it is approved, the form is saved to the Laserfiche repository with the Save to Repository service task. This task also allows the user to specify the template and fields that will be appended to the submission in Laserfiche. 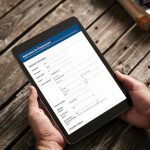 The entire application process is paperless from start to finish, which means no lost or illegible applications. Administrators can track each application throughout the process, allowing them to make sure that work is accomplished in a timely matter. If delays occur, administrators can quickly locate and address them.